Our pantry has long since been stocked with CRYSTAL LIGHT – but now we have another great reason to stock up! CRYSTAL LIGHT has teamed up with Walmart and country sensation Miranda Lambert to offer their customers a way to get cool rewards just for purchasing their favorite beverage! Head to your local Walmart store, and purchase qualifying CRYSTAL LIGHT products. Snap and upload a pic of your receipt and start earning points! You can win awesome Miranda Lambert gear – from exclusive song downloads, her new Platinum CD, a mug, a tumbler (which I just LOVE! ), a shirt, or even a signed guitar!! Why not get rewarded for drinking a delicious beverage?! Want to find out more about CRYSTAL LIGHT? Check out the CRYSTAL LIGHT website! When you enter the code “mirandaic” you’ll get 30 points – just for signing up!! You can also receive 10 points for each friend you refer who signs up!! Signing up for the Platinum Points Program is EASY! It only takes a second! All you need is a smart-phone and your receipt – then you’ll be ready to earn rewards!! 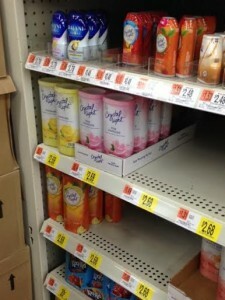 When we go shopping at Walmart, we know right where to find our favorite CRYSTAL LIGHT products. Our family loves the flavor CRYSTAL LIGHT adds to our water (especially without adding sugar and excess calories!) Our hands-down favorite flavor is Peach Mango Green Tea. It is DELICIOUS! (We turn it into quick ice pops in the summer for zero-calorie & refreshing treats!) Other favorites around our house include Natural Lemonade, Raspberry Lemonade and Strawberry Orange Banana. Today, I headed into my local Walmart, and picked up a handful of CRYSTAL LIGHT canisters. These are perfect for families, and we always have a variety of flavors on hand. Each canister comes with 5 pouches of drink mix, which mix up to make a full pitcher of CRYSTAL LIGHT. (That’s 5 full pitchers in every canister!) 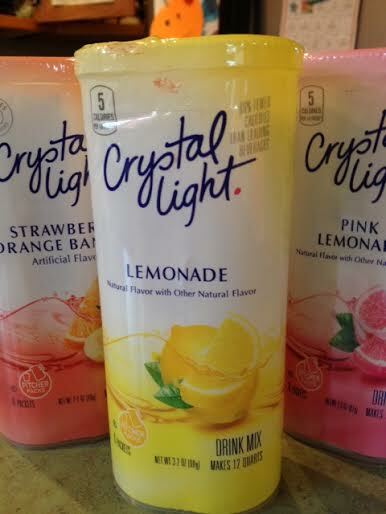 The kids love CRYSTAL LIGHT and I love quality products at low prices – we all win! At home, I snapped a quick pic of my receipt, and uploaded it to the Platinum Points website. The program sends you a text message to let you know that your picture was received and is being processed for rewards. In no time at all, that CD and platinum tumbler will be mine! CRYSTAL LIGHT is a quick and easy beverage to mix up for the kids and a delicious way for them to stay hydrated. We’ve used CRYSTAL LIGHT when making gelatin, have used it for popsicles, and it also makes a low-calorie mixer for cocktails or mocktails. If you’ve never tried it, now is the best time! Check out this tasty beverage AND score some great Miranda Lambert gear in the process! *You also just might want to check and see if Miranda Lambert is coming to a city near you! This exciting new program coincides with her new Platinum tour, sponsored by CRYSTAL LIGHT. You are in for a fantastic show! Sign up for the Platinum Points program today and start earning that Miranda Lambert gear! Enjoy! Let’s raise of glass of CRYSTAL LIGHT and enjoy our week!